Tolentino, 13 January 2015 – Arena, one of the world’s leading brands in aquatic sports, continues to grow its Australian presence through a new sponsorship deal with exciting freestyle and medley talent Thomas Fraser-Holmes. The 23-year-old from Newcastle, New South Wales, is the current Commonwealth and Pan Pacific 200 freestyle champion. Hailing from a country with a long line of champions in 200 freestyle, over the past few years Fraser-Holmes has emerged as one of Australia’s biggest hopes for Rio 2016 in his signature event. Having started winning international medals as an 18-year-old at the 2010 Commonwealth Games in Delhi, he pushed on to finals at the 2012 Olympics and 2013 World Championships before realizing the podium success in 2014 that his talent has promised. In July he snagged the gold medal at Glasgow’s Commonwealth Games, and a month later did the same at the Pan Pacific Championships in his home base on the Australian Gold Coast, beating an impressive field in the process. His 1:45.08 title in Glasgow remains the world’s fastest time of the year. He has also transferred his promise to the Australian 4x200 free relay team, which won gold medals at both 2010 and 2014 Commonwealth Games, and bronze medals at the 2010 and 2014 Pan Pacific Championships. While 200 freestyle is currently Fraser-Holmes’ strongest event, the 400 individual medley is not far behind, displaying similar growth and results. Following his fifth-placed finish at the 2010 Commonwealth Games, he went on to finals appearances in London and Barcelona, before picking up his first major 400 IM medal – a silver – at the 2014 Commonwealth Games. A month later he finished one place out of the medals at the Pan Pacific Championships, in a time that vaulted him into the world’s top 10 for the year. He is also a regular podium contender in 200 IM. 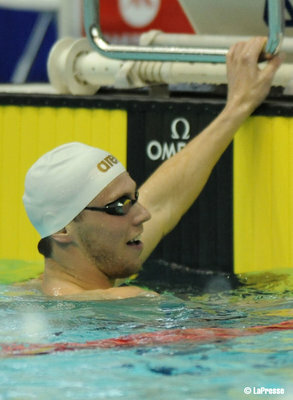 Fraser-Holmes is based in the Gold Coast, and trains with Australian coach Denis Cotterell at the Miami Swimming Club. He joins fellow Australians Cate and Bronte Campbell, James Magnussen, and Emily Seebohm inthe arena Elite Team of champions.